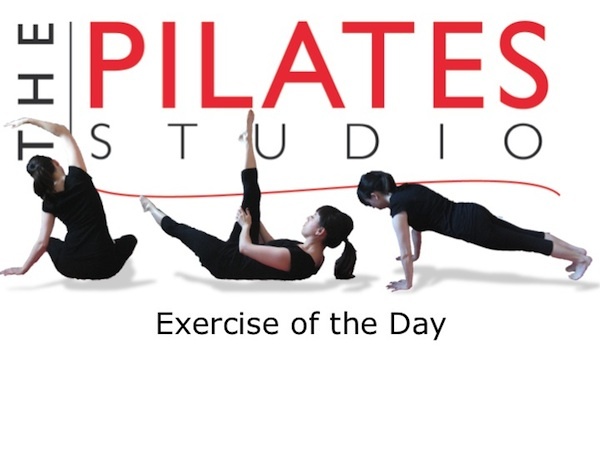 This exercise is a variation of the classic Pilates Exercise. The towel offers assistance to complete the spine articulation required for this exercise. To do this exercise you will need a mat and a small towel. Roll up the small towel and then lay it under your low spine when you lie down. Start by lying down with your legs lengthened long beneath you and your arms lengthened on the ground behind your head. Inhale into the back of the ribcage and then exhale as you arc your arms into the air and lift your head, neck, and shoulders. Continue the exhale as you articulate through your spine to a seated position. Then inhale in the seated position and exhale as you roll your spine vertebra by vertebra to the floor. Repeat 8-10 times. If you have osteoporosis, try yesterday’s roll up exercise in a neutral spin. The towel helps connect the lower body to the upper body in this exercise so if in the classical version of the roll up you are finding that you get stuck at the ribcage this exercise may be perfect for you.